Capture of large parts of Iraq by the Islamic State of Iraq and the Levant (ISIL) and declaration of establishing a Caliphate signals the start of a new phase of expansion of a powerful Sunni Islamic group in its well declared aim of establishing an Islamic empire encompassing the entire globe. The phenomenon of extremism and sectarian violence unleashed in Pakistan by the so-called strategic assets of the Pakistan army is not under anyone’s control now, and south and central Asian nations should be highly concerned about the shape of things to come after the ISAF’s withdrawal from Afghanistan. Illegal immigrants from Bangladesh have been a cause for concern for India since a very long time, but recently, the problem of illegal immigrants from Bangladesh once again came into limelight because of a major communal clash between the settlers and ethnic Bodo militants in the backdrop of the general elections in Assam. Time has come to find an amicable solution to this problem. After their ouster from Afghanistan, al-Qaeda retreated into Pakistan, went underground and decentralised. But it soon resurfaced in various countries of west Asia and Africa. In the 1990s, Osama bin Laden and associated militant groups shifted focus toward the West – the Far Enemy – calling them oppressors of Muslims worldwide. Osama called for a ‘global jihad’ against Western interests around the world to counter the enemies of Islam. Al-Qaeda soon started catastrophic terrorist attacks and suicide bombings against the West, making civilian their main targets. Al-Qaeda, at the same time, advocated the establishment of Islamic laws and old tradition in all Muslim lands and gave a call for a widespread ‘global jihadist movement’. In India, Wahhabi activism has increased visibly. They are slowly taking over mosques and madrasas with the aim of turning moderate Muslims into adherents of al-Qaeda’s ideology. Pakistan continues to play a major role in spreading religious extremism and promoting sectarian violence in south Asia and facilitating the return of the Taliban regime in Afghanistan and al-Qaeda in south Asia. The main reason for the political and religious support of al-Qaeda by Pakistan is the growing support for radical Islam and the reliance of the Pakistan army on fundamentalist outfits for regaining control over Afghanistan. The widespread phenomenon of extremism and sectarian violence let loose by these so-called strategic assets of the Pakistan army is not under anyone’s control now, and south and central Asian nations need to be deeply worried about the shape of things to come after the withdrawal of the ISAF from Afghanistan. Pakistan continues to provide a safe haven and training and recruiting facilities to al-Qaeda and a variety of terrorist outfits helping the upsurge of al-Qaeda-Taliban and jihadism in the Afghanistan-Pakistan region. Al- Qaeda is likely to spread jihadi terror in central Asia, India and Bangladesh and use Wahhabi groups for demanding the implementation of sharia laws in Pakistan, Bangladesh and Kashmir. In India, Wahhabi activism has increased visibly. They are slowly taking over mosques and madrasas with the aim of turning moderate Muslims into adherents of al-Qaeda’s ideology. India must wake up to the threat being posed to its culture and integrity and vigorously counter Wahhabist activities and propaganda. India should also actively help those organisations in Afghanistan that are ready to fight extremism to prevent the resurrection of al-Qaeda in South Asia. Wahhabism is being actively propagated in various Muslim pockets of South Asia. For example, a Sri Lankan national, Zakir Hussein, arrested in Chennai recently was found to be an operative of Pakistan’s Inter- Services Intelligence (ISI) and planning attacks on diplomatic missions and other sensitive targets in Chennai, Maldives and Sri Lanka. The ISIsponsored terror cells active in the South Asian region pose a severe threat to the entire region, and it is of critical importance for India, Lanka and the Maldives to join hands to counter the menace of sponsored terrorism in the region. At present, no one authority is responsible for identifying the illegal migrants and dealing with the problem of foreigners. A report says, ‘al-Qaeda chief Ayman al-Zawahiri has called for jihad in Bangladesh in an audio message posted by al-Qaeda’s media production house “As-Sahab Media” on a website jihadology.net, which promotes jihad across the globe.’ As per media reports, the message titled ‘Bangladesh: A Massacre Behind a Wall of Silence’ contains photographs from Hefajat-e-Islam programmes and severe action against them by security forces. Zawahiri claims, ‘This is the bloodbath taking place in Bangladesh, without the Muslims paying the least attention to it. Bangladesh is the victim of the conspiracy in which the agents of India, the corrupt leadership of the Pakistan army, and treacherous power hungry politicians of Bangladesh and Pakistan, who are always prepared to sacrifice everything for the sake of fulfilling their ambitions and desires, were all equal participants,’ Zawahiri observes. The message of al-Qaeda chief Ayman al-Zawahiri is to encourage the fundamentalist Islamists to stand up against the secularists of Bangladesh in the ongoing struggle for supremacy. So far, there is no evidence of al-Qaeda’s presence in Bangladesh, but groups such as Harkatul- Jihad al-Islami-Bangladesh (HUJI-B), Jagrata Muslim Janata Bangladesh (JMJB) and Hefajat-e-Islam are trying to facilitate the return of al-Qaeda. …analysts has called the migration of Bangladeshis into India as demographic invasion. This term indicates a deliberate planned attempt to change the population complex with a view to turn certain areas into Muslim-majority areas. The unabated illegal migration from Bangladesh into contiguous Indian states has led to widespread demographic changes in the north-eastern region of India. Over a period of time, ethnic and religious tensions have brewed in these areas, leading to serious internal security problems. As Bangladesh does not acknowledge the fact that a large number of illegal Bangladesh citizens have indeed settled down in India, the first requirement of Indian authorities is to find a foolproof method of identifying illegal migrants and establishing their nationality beyond any doubt. At present, no one authority is responsible for identifying the illegal migrants and dealing with the problem of foreigners. It will be extremely difficult to identify and deport Bangladeshis in the absence of an overarching national policy or authority to deal with the issue. A section of security analysts has called the migration of Bangladeshis into India as demographic invasion. This term indicates a deliberate planned attempt to change the population complex with a view to turn certain areas into Muslim-majority areas. There is little evidence to support this theory as mostly the poorest segments of landless Bangladeshis, driven by hunger and abject poverty cross into India. However, the large population of illegal migrants from Bangladesh in some states, like Assam, is depriving the indigenous population of its lands and avenues of employment, leading to frequent rioting and bloodshed. India needs a dedicated central agency for identifying the foreign elements in Assam. India must accept the fact that the problem of migrants is an uncomfortable reality and it will not be feasible to push out millions of unidentifiable Bangladeshis from the Indian states. As per the 2001 census, there were 84,826 illegal immigrants from Bangladesh in India, but no reliable figures of illegal immigrants are currently available. Though the census data of Assam indicates a figure of 2 million, figures as high as 20 million have been quoted in certain government and media estimates. Assam has a large number of Indian Muslim Bengalis, who cannot be easily distinguished from illegal Bangladeshi migrants, and many observers believe that a significant number of local migrants are sometimes included in estimates, quoting very high figures. In 1985, India started building a fence along the Assam-Bangladesh border, which is now almost complete. But the inflow from Bangladesh continues unabated. India must accept the fact that the problem of migrants is an uncomfortable reality and it will not be feasible to push out millions of unidentifiable Bangladeshis from the Indian states. In these circumstances, several recommendations to refranchising them and issuing of work permits to the migrants for fixed periods besides developing a workable mechanism with Bangladesh may be considered. Bruce Reidel. ‘Al Qaeda’s Next Comeback Could Be Afghanistan and Pakistan.’ 13 January 2014. <http://www.thedailybeast.com/articles/2014/01/13/ al-qaeda-s-next-comeback-could-be-afghanistan-and-pakistan.html>. Global Voices. ‘Al Qaeda Calls for Jihad in Bangladesh.’ 24 February 2014. <http://globalvoicesonline.org/2014/02/24/al-qaeda-calls-for-jihad-inbangladesh>. Sir,I like your articles on geopolitics and strategic concerns of india.I developed interest in geopolitics by reading your article at very early phase of my life .thanks a lot for your guidance. :-)your way of explaining things is so simple that it invokes interest. Even a kid can understand thats the best aspect of your writing. Well written! But, I am unable to understand the conclusion! 1. India already provides work and education visas to the Bangladeshi nationals! So, the point of granting fixed term work visas or something similar is actually redundant! 2. Even if India wishes to provide any such visas for fixed term, it would require Bangladesh to acknowledge the illegal immigration into India, which would be self-defeating for Bangladesh! 3. It is always difficult for India to accept Bangladeshi immigrants! India is already a land starved country and realistically impossible to tolerate distress migration! 4. Distress migration is a serious issue, that can be checked only by fenced and strong borders! this essay is best effort of Indians to hide the terrorism of indian intelligence agency RAW > there is only 1 major terrorist attack only in Americas and in india just 1 hotel bombed> in Pakistan in 100s all wapons and explosives where used in attacks wher Indians made and imported frm Afghanistan.PaKISTAN HAS FIRM PROOFS> HOW RAW IS GIVING FINANCIAL SUPPORT AND WAPONS AND TRANNIINGS TO THESE ELEPMENTS WHO KILLED 50000 PAKISTANIES. “Re-emergence”? Islam was always there. Since before the Mahdi that Kitchener silenced or the Ottoman Islamists that Ata Turk silenced. Say rather that they are continuing to evolve, taking advantage of the venality of the decision and opinion makers of the West and the ignorance their vote fodder. It was Clinton and Albright that bombed Belgrade for 84 days to give Islam its first ethically cleansed emirate in Yugoslavia and egged Iraq into war with Iran and to invade Kuwait. This was followed through By Tweedles Bush and Tweedle Blair who toppled the sole secular, prosperous counter poise to the Caliphate to protect Pakistan and Saudi Arabia from the post 9/11 anger of their Vote-Fodder. While the US drops an egg or two to show that it is doing something, its tactic is to ensure that its “Cut and run” from Iraq prevails. The US strategy of establishing an Islamic Caliphate is easily discernible. US strategy is driven by the Saudis since the day of Sheikh Yamani. The Saudis financed Clinton’s Presidential bid and are favoured guests of the Bushes since the days when Bush Senior was still a Director of the CIA. US tactics and operations are designed to appease the vote-fodder. Needless to say, strategy trumps both tactics and operations leading to the triumph of Islam. Maj Gen Afsir Karim, thank you for this thoughtful article. The Islamic extremism now manifesting in the form of ISI is a phenomenon that is above and beyond the (normal) upheavals of the Middle East. The ISI marauders are the generation-next of Al Qaida, promoting fascism, hate and senseless violence in the name of allah. They are not fighting for their human rights or political freedom. They are fighting to take away everyone else’s human right and political freedom. They wish to spread Sharia laws worldwide which will facilitate annihilation of non-believers and destruction of non-Islamic places of worship, and the enslavement of women. If we need a proof watch a news channel. They are already engaged in these horrific acts of violence against the Kurds in Iraq, as we speak. We may wish to ignore them until they arrive at the doors like they are in Iraqi cities or we understand who they, what they stand for and commit all the necessary resources to wiping them out like a virus or a plague. The insurgency in Kashmir aided by Pakistan is the start of the ISI in India. The local political parties in Kashmir are merely surrogates of the enemy across the border. Stop pretending they are fighting for human rights or political freedom. Infiltration from Bangladesh, Nepal, Sri Lanka where they find fertile grounds for mobilization must be closely monitored. Any anti-national activity in the South or North East should be stepped on as soon as discovered. India must form alliances with Israel and the NATO nations to augment it’s resources. 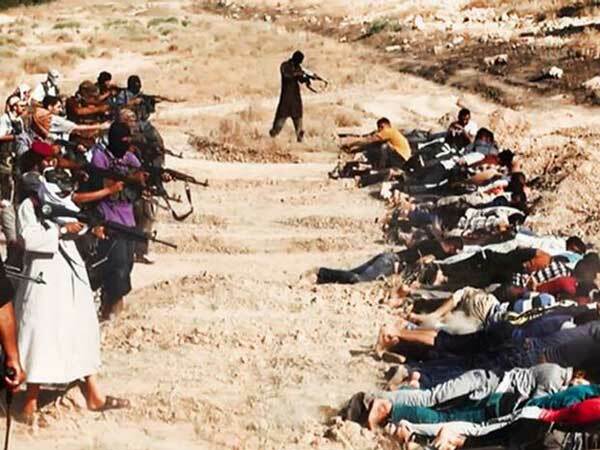 This is a war against barbarians who are using a theology frozen in time to justify their inhumanity towards others. Everyone is a potential target and a good reason to join hands to face the common enemy. The people of India must demand action starting now.